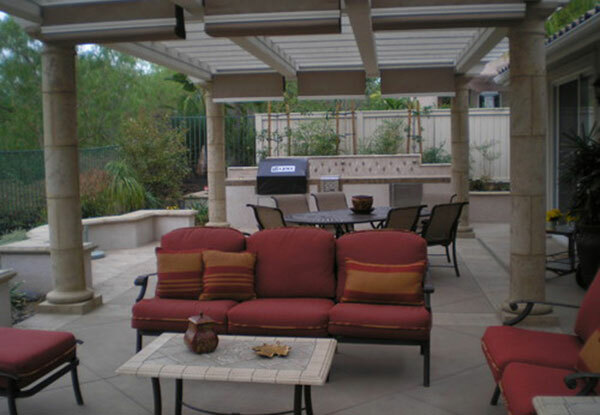 This patio in Vista, CA was custom designed by Daniels Landscape to create the perfect outdoor space for entertaining guests. The space features an outdoor fireplace, a BBQ, and a giant pergola to provide shade on sunny California days. 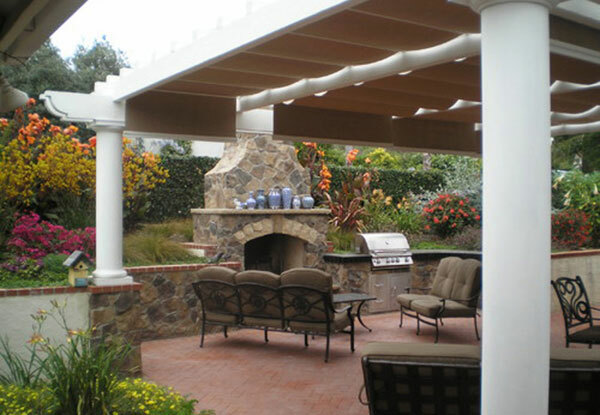 This formal outdoor kitchen in Kensington, CA features a BBQ, kitchen countertop, and outdoor fridge. The space is covered by a huge pergola which sites on aged concrete columns with overhead canopies that can be moved to provide desired sun exposure. Daniels Landscape designed and built this outdoor kitchen in La Jolla, CA to complement the style of this gorgeous Italian Villa complete with a custom pizza oven. The kitchen features natural limestone walls, built-in granite cutting boards, hand-painted ceramic tiles, and concrete flooring designed to look like custom tiles. 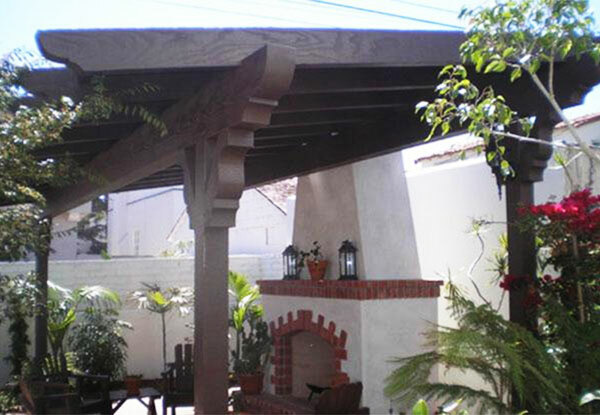 The lattice wood patio cover provides a shaded area over this spanish-style outdoor fireplace in Point Loma, CA. 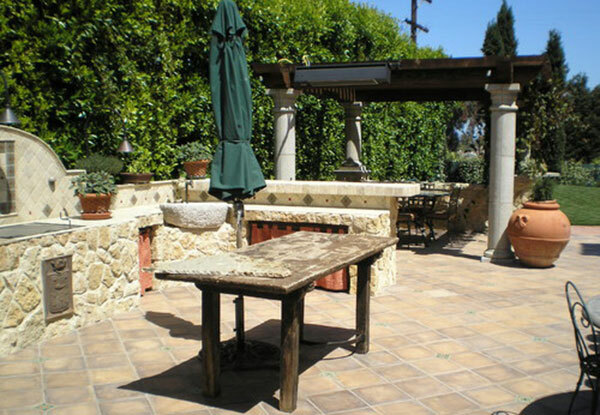 Outdoor kitchens are wonderful for California weather and spending time with friends and family. 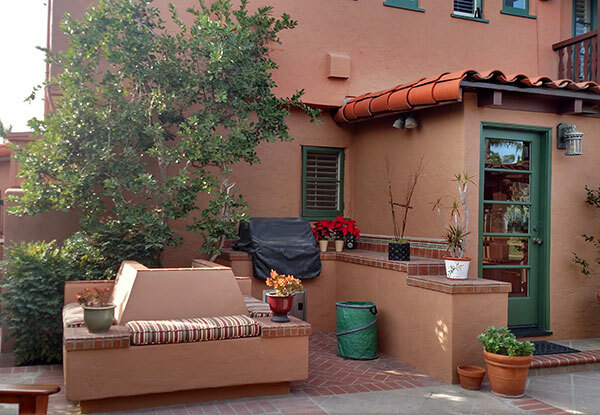 Daniels Landscapes Inc. performed this built in seating masonry in the Kensington neighborhood of San Diego. Daniels Landscape redid my entire back yard and part of my front yard. They did grading, turf, irrigation (valves, pipes, sprinklers, timers, weather station), landscape lighting, design, garden layout, paths, fountain, pot installation, solar conduit installation, and drainage. All employees were completely knowledgeable, professional, and were experts in landscape design and implementation. They were on time and efficient. Communication throughout the projects was excellent. They also guarantee their work. It was the best experience we have had throughout our year and a half home remodel. I can't say enough good things about the owner, Dan, and his employees. If you want your landscape done properly and beautifully, this is the company for you.